It’s hard to believe it has been 3 months. Since the acquisition, we have been working diligently (and harder than we have ever worked in our lives). We wanted to take a moment to give you a quick update on the work being done, and it’s also important for us to share our vision for the future. Enom and OpenSRS now form the largest wholesale registrar in the world. The 2 brands under the Tucows umbrella have nearly 40 years of combined industry experience. The acquisition of Enom shows that Tucows continues to believe and invest in the wholesale domain space. We have started multiple engineering initiatives focused on improving the Enom platform such as more convenient login and credentials management. You will see more features rolling out over the coming months, such as a new end-user access portal. We are committed to putting our customers first so, as a reseller, you should expect us to get involved with you. We are interested in getting your input over the next couple months so we learn more about what your needs are and empower you to be successful. At Tucows, we strongly believe in great customer service. We have been actively working on improving service for all Enom customers, including new support tools and systems that better connect your needs with our solutions. Expect us to further invest in our customer service for Enom so we can serve you even better. Now being the 2nd largest domain registrar worldwide, with two excellent brands and a combined team of great people with many years of experience, we have a unique chance to develop our wholesale services platform with tools that are tailored to our customers needs and are easy to use. Tucows will continue to run the Kirkland office. With more than 80 people, Kirkland will continue to house a significant portion of the talent responsible for the domains business. We are currently hiring customer service advisors and an UX designer to join our Kirkland office. As a talent looking to join Tucows in Kirkland, expect to work for a passionate team that values your career development and opportunity to have an impact. We are dedicated to the best solutions for our customers, creating tools and services that you can be proud of. We have free Friday lunches, are dog-friendly, and are located across from Houghton Beach in Eastside Seattle’s only waterfront town. We’ll keep you up to date as the work progresses on our end. One of our main goals for 2016 was to help you, our customers, build your businesses and projects by strengthening the underlying foundations of our platform and company. All year we’ve rolled out features and products that may not have been noticed immediately, but were certainly felt. Behind the scenes, for example, we have a new CMS, new API interactions, and new admin tools for our support teams. These have made your experiences with us faster, more reliable, and more secure. Collectively, we referred to all of this year’s improvements as the Enom Evolution. “Evolution” isn’t a term we take lightly, and it’s a process that doesn’t happen overnight for a 19-year-old business. When you look back on 2016 and consider the whole body of product releases, so much has changed. That continuous advancement is a large measure of our collective successes in 2016, and that’s how I see 2017 taking shape — only ratcheted up to another level. Everyone at Enom has contributed to the company you see today. Below are the reflections from a few of our product managers, so you can get a taste of the extremely hard work every Enom team and employee has put in this year. What were your team’s big goals for 2016? We had three big goals for the year: 1) launch the new, more modern Enom.com website and developer portals, 2) bring G-Suite and Encryption Everywhere to market, and 3) continue to evolve our developer platform. Which feature, service, or product was introduced to Enom this year that you are most proud of? I’m really most proud of the new site. We’ve laid a solid foundation, and soon, it’s going to allow us to radically improve the shopping and domain management user experiences. What part(s) of the Enom experience do you see yourself looking to improve in the new year? Next year, we’re going to continue to build on the progress we’ve made on the new website, completing our efforts to modernize Enom.com from top to bottom. Plus, a few very exciting things I can’t quite share yet! We aimed to make huge strides in improving the developer experience this year. We improved account security through the introduction of API tokens, and enhanced our reseller offerings with G-Suite. We’ve also focused on greater transparency with the the Developer Hub and Enom Status page going live in 2016. I’m most proud of the API tokens, which really are an exponential improvement in account security, as well as the integration with G-Suite, because of the great work the team put in to become Google’s first wholesale partner to offer their productivity apps this way. Going into 2017, we’re really happy to start putting our WHMCS integration to work for our resellers. Encryption Everywhere, which is already available via the API, will provide a lot of value for the entire Enom platform in the new year. Any other reflections on Enom in 2016? I’m really happy to see the improvements we made to the user interface this year. I’m also excited that the groundwork we’ve laid for widgets will start paying off in 2017. We started the year with a new leadership team to bring a focus to our product vision, and we’ve made many improvements in our offerings and user experience. We added a major new value-added service, G-Suite, and have a new blog and status page to help communicate with our customers. We finally began our long-awaited redesign of Enom.com, launching a new site and branding in June. The site is built on a new CMS that allows us to make changes in real time, something that was wishful thinking just a year ago. Behind the scenes, we’ve really improved on our development process, and are getting better in terms of product planning. We’re going to start 2017 with a complete product roadmap which we’ll be able to share with our customers soon. The Platform/RegDev team launched 40 nTLDs onto the Enom platform this year. That included supporting 43 “phase shifts,” 40 General Availability events, and 15 Early Access Programs. We also introduced Super Check, a tool that improves registry communications on domain checks. This year we implemented an internal administrative tool called “God Mode,” which was a product of a company-wide hackathon. God Mode saves valuable time for many departments and employees, including Support and Sales teams which can now assist customers much faster with this tool. Next year we’ll be kicking off work on the next generation Pricing Engine (PEG) to replace our legacy pricing engine. We often use this blog to reiterate the importance of web security, and hopefully it’s clear why: Buying a domain is a great first step, but we want to make sure our customers can use them, too. Whether it’s for business or personal use, a website needs to be protected from malicious actors all over the world. Yet while SSL certificates are the first line of defense against hacking, only 3% of domains are currently protected by them. This is why we have joined Symantec’s new Encryption Everywhere program. This is a huge leap for customer security on our platform, and we’re very excited to start offering this protection. Encryption Everywhere is Symantec’s solution to have 100% SSL coverage for all websites by 2018. To that end, we are going to enable Symantec’s Encryption Everywhere SSL certificates for all resellers via the Enom API. Similar coverage for all of our retail customers is also on our 2017 roadmap. These Domain Validated (DV) single-domain certificates are what Symantec considers the new baseline level of web security. Customers that need additional features and protection will be able to easily upgrade to appropriate certificates. Wanting to protect domain registrants and their websites’ users from cyber criminals should be a no-brainer. But there are additional motivations for a 100% SSL-covered web, as well. Search engines are now prioritizing secured websites in their rankings. Internet browsers are also beginning to scale back features for sites outside of the HTTPS standard. In short, with Encryption Everywhere SSL certificates there are few reasons why a website shouldn’t be protected, and more and more reasons why it should. Ramping up from 3% to 100% coverage by 2018 may seem like a monumental task, but Enom’s own platform has seen its own extensive changes in the course of a year, and we feel that the substantial benefits for our customers is worth the effort. For our reseller customers, we’ve built a landing page explaining the Encryption Everywhere program in more detail, and we’ll have more information for retail customers in the new year. Enom resellers, click here to learn more. Have you been to enom.com today? You might have noticed a few changes from the site you’ve gotten used to for all these years. Yes, you’re looking at a new logo, a new homepage, and brand new features that make registering domains easier than ever. It’s all a big step in our strategy to modernize the way we do business and take us into a new era. Enom is evolving, and this is just the start. It was six months ago that we were recapping a successful 2015, a year of growth and technical improvements for the Enom platform capped off by a big upgrade to our DNS. What we were most excited about, though, was combining our experienced staff with an influx of personnel that would help us chart the company’s future. This new mix of personnel has driven us to build an experience that is both user- and developer-centric, and the changes that went live today are a great representation of our shared vision. Some portions of the former enom.com website hadn’t been touched in many years. There’s always the temptation to develop something new for the sake of being new, but with over 3.8 million unique users a year, the first priority has always been ensuring a trusted, stable retail experience. Fortunately, the investments we’ve been making in personnel and technology have given us the opportunity to innovate while continuing to play to our strengths. The launch of the new enom.com is the biggest public demonstration of these investments to date. The industry has changed a great deal since Enom was founded in 1997. Mobile devices, cloud & streaming services, and new domains have all made the internet more accessible for everyone. But those same technologies coming at us so fast have created a technical barrier for some. The new enom.com helps cut through the complexity, giving help (or opportunities for self-help) to a diverse set of users, from individuals, to small businesses, to resellers and domain investors. The bedrock of the online experience is still tied to domain names, and we have new content designed to demystify the domain lifecycle and help customers choose the most memorable, effective names. Ourrevamped search and suggestion engine can provide customers hundreds of options in picking second- and top-level domains that fit them perfectly. 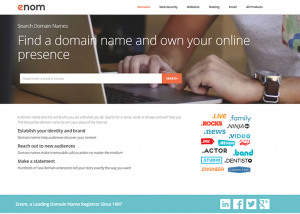 To help inspire everyone to get online, we’re highlighting examples of real Enom customers using domains (and new TLDs) to build their businesses, brands, and online identities. Over the last few months, we’ve unveiled a couple of the improvements that we’ve made behind the scenes. These improvements were undertaken specifically to improve the developer experience, a huge component of what we do given that 80% of Enom’s domains under management come through our developer API. 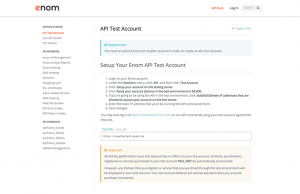 In addition to API tokens, the launch of our new Developer Hub has been a big step in modernizing the Enom platform for our longtime customers and partners, as well as introducing us to a new generation of developers. The Developer Hub is already live and we’ve been getting some great feedback on this constantly evolving resource. And while the enom.com relaunch might not appear to be a feature for developers, it does actually have big implications for the reseller channel. All of our developer-facing improvements this year are geared toward making it easier to integrate with our services. One way to do that is by making Enom’s assets available to be leveraged in your own business. That’s why we’ve built a new layer in the enom.com UI, which we’re calling widgets. Widgets are small, modular collections of UI and functionality (our domain search bar and search results page are two examples), that Enom API developers will be able to drop directly into their own sites to take advantage of the same features with less backend work. We’ll be releasing more information and tools to integrate widgets soon, for now, rest assured that the work we’re putting into enom.com has the dual purpose of making your life easier, too. There’s a reason we’ve referred to these changes as an evolution: This isn’t just a one-off event, but a constant process of improvement, one we’re carrying out through 2016 and beyond. In the coming months, we’ll be showcasing even more improvements to the website and developer portal, new value-added services and products, and much more. For many, the new logo you see at the top of this post and throughout the new website is what will have jumped out at you first. We hope the new design will feel both familiar and modern to you. We want to maintain the connection to all the customers and partners that have helped build Enom into what it is today, while acknowledging that this industry continues to move ahead at an incredible speed. We are ready to meet the future and are thrilled that you’ve chosen to join us on the journey. Our promise to you is that every improvement we roll out will be with you, the user, in mind. There’s much more to come this year, so be sure to keep watching the blog, and subscribe to our retail and reseller newsletters for the next big reveal.